In our day and age it’s getting increasingly difficult to get by without knowing a foreign language…what with all the globalization and movement of people. But if your knowledge of other tongues fails you, you know that you can always count on online translators…or so many people seem to think. Thanks to people like that, we can present a delightful little collection like this to you that certainly made us LOL, ROFL and LMFAO over the course of 2014. Enjoy and may 2015 bring us even more epic translation fails! This has to be one of our favorites! The word «testo» in Russian means dough – too bad whichever online translator was used failed this «test»! And, of course, «язык» is the word for tongue and language so we guess we can see how the poor thing got confused…sorta. Note: this is NOT how you say cauliflower in English…or in Russian for that matter. Post by Бюро переводов GMC Translation Service. When smoking isn't the most dreadful thing that can happen. 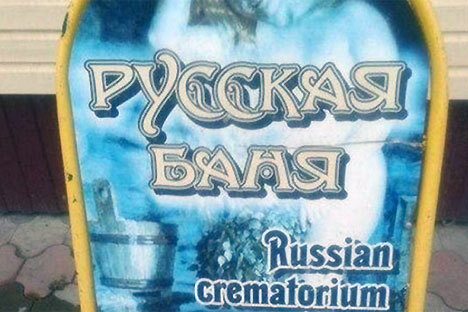 We can assure you that a traditional Russian banya has NOTHING to do with crematoriums! It's all up to your imagination, literally. «I'm finding it very very difficult to put together a proper name for this dish out of the available English words and the online translator is giving me complete and utter nonsense. I even watched the video how this dish is prepared».